Design Your Own Theme Park! Think you can design and build the greatest amusement park in the world? You select the site, you lay out the rides and attractions. You control every aspect of running a profitable amusement park; from staffing to R&D. Any mistakes, and tourists who populate your park will be sure to let you know. Oh, and that merry-go-round in flames is a clue, too. Theme Park is notorious for an amusing event you can apply to the tourists. Simply construct a a rollercoaster that has an extended, steep drop in the track that snaps into a 180 degree turn. If you’re patient enough, tourists will fly off the cart. Bullfrog’s brand name was quietly killed off when EA merged studios around 1999. Oddly enough, a certain man named Peter Molyneux left the company to form Lionhead Studios. Theme Park has a peculiar persistent mis-step in it’s artwork. The original Long Box has the ESRB rating, but is missing the Descriptor box and ESRB phone number. 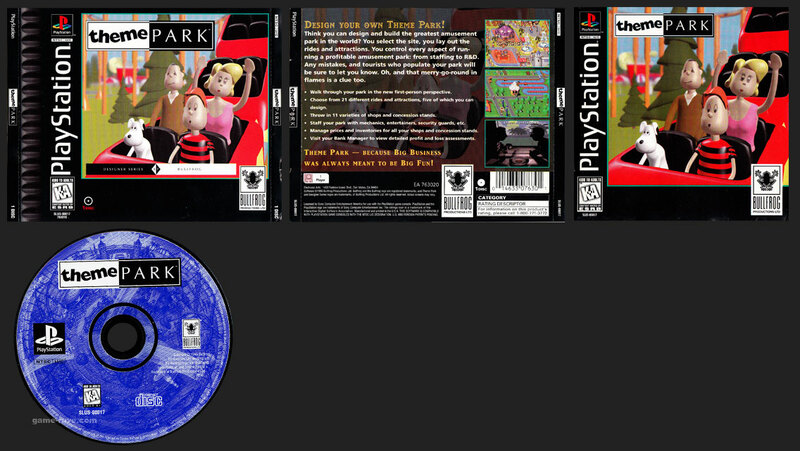 On the jewel case release, these missing items are now present, except the explanation box reads as the place holder “RATING DESCRIPTOR” text.